Today we take a look at our visit to Lakemont Park on Saturday. This amusement park is an Altoona staple, with roots as a trolley park dating back to 1894. We always have a blast at this nice little park. Our first stop was on the park's classic Eli Bridge Ferris Wheel. There was no baseball game going on, but the views of the ballpark from the coaster makes the location of this coaster pretty awesome. This John Allen PTC coaster is an underrated gem. It dates back to 1960, and it was originally built at Roseland Park in Canandaigua, New York, at the northern tip of Canandaigua Lake, one of the Finger Lakes in New York. The park closed in 1985 and Skyliner was disassembled and then rebuilt at Lakemont for opening in 1987. Brit had enough after a bunch of rides in the front. I rode a bunch more times in the back. The crowds were really light, so we probably ended up riding the Skyliner about twenty times throughout the night. Works for me for the ride offers some of the strongest ejector airtime out there. The front seat has one huge pop of ejector airtime heading into the first turn around. The backseat had tremendous ejector time down almost every hill! It was running the best that I have ever experienced it. This ride feels like a totally different ride from front to back. Sitting in the same seat for several rides in a row, you can really feel the way that wooden coasters give a wide variation of rides on each individual ride. You can never quite predict what will happen next, which is one of the reasons that I am drawn towards wood coasters. You can ride a wooden roller coaster twenty times in a day and it will give a vastly different ride each time. From day to day the rides are radically different. Skyliner was really hauling during this visit. Very few coasters pack in that much ejector airtime, especially on almost every hill. This is definitely a backseat ride, but the front is pretty awesome too. There you get a better appreciation of the manner in which John Allen designed the transitions on this ride. There is not one part of the ride with a straight airtime hill. All of the smaller hills are designed in a twisted manner, not one bit of straight grading in the airtime hills. This is one great coaster that proves that even with a drop of only 60 feet and a length of only 2400 feet, you can build a pretty wicked ride that is more powerful than rides that are immensely larger. All I can say is wow! This picture really shows how powerful that backseat airtime was. The PTC train is beautiful too. The wooden running boards, dark green side panels, and deep maroon interiors really make the train look great. And the park's Eyerly Spider is ridiculously fast. We were flat out shocked at how strongly it was running. We always have a great time on it, but this felt was pulling some serious G's this time around. About as intense of a spinning flat that I can think of. And over to the Chance Toboggan, one of the last two toboggans operating within amusement parks. Are there any others on the traveling circuit that anyone knows of. I know the Conneaut one is in storage right now. Anyways, this is a fun ride! The original type of coaster with a vertical lift. The seemingly endless turns down the tower on the way down are lots of fun. Now onto the world's oldest coaster, Leap the Dips. It is pretty amazing to think that this coaster has been around for 113 years. While the drops are only 9 feet tall maximum height, the coaster offers a thrill without a lapbar or seatbelt. The ride operator was kind enough to snap a photo for us. The ACE Coaster Landmark sign. These are great for community awareness about the importance of these coasters. I would love to see the Skyliner get similar recognition as well. We took a break from the rides for a little bit and sat along the water where you are welcome to feed the fish and the geese. Now for a round of mini golf. The rail theming is pretty neat, and a cool recognition to the rail heritage of the region. Now that is what I call awesome recycling! This is the Gallitzin Tunnel hole, an ode to the tunnels in nearby Gallitzin. A view of the midway. Had the train to myself for four rides at the end of the night. Sunset over the Skyliner. Just another awesome Lakemont day. We always love visiting this relaxed and really inexpensive park. All of the park's rides are fun, but the Skyliner offers some world class airtime in the backseat that is about as good as it gets. We probably took at least twenty rides on it on this visit, and it was all out awesome. For a long time, Rye Playland has been a bucket list park for me. An opportunity came along to take a trip out there this past weekend and we could not pass it up. This is one of the most polished amusement parks out there, with historic midway buildings, rides, and beautifully manicured gardens and midways. This is an all around charming seaside park, one that looks like the postcard images of the seaside parks and towns of old such as the old Casino at Asbury Park, turn of the century Coney Island, and others. This is one of a rare breed of grand seaside amusement parks, and it is kept up as well as any park out there. All of this preservation and upkeep has earned Rye Playland the National Historic Landmark designation, one of only two parks to receive this title. Kennywood Park is the other park with this designation. The first thing you see as you go to enter the grounds is the Art Deco styled Playland Ice Casino. At over 85 years old, this structure is simply stunning. The building sustained heavy damage after Hurricane Sandy, and it reopened last October, two years to the day after the storm hit. The park has a really nice stage situated on one end of the midway that faces down the entire park midway. On September 5th they will be hosting a free Village People concert. We arrived about an hour before opening and decided to stroll around the beach and boardwalk area. The day was absolutely gorgeous. A look at the historic boardwalk and Rye Playland Bathhouses building. This building now houses the Westchester Children's Museum with many hands on and interactive displays for children. Look familiar? The final sequence in the 1988 Tom Hanks movie "Big," was filmed at Rye Playland. "I would like to be a kid again." What better place than to open up a new children's museum? I wish this organization the best of luck. The view from the fishing and boat launch pier. This is the first sight that boaters see of the park after docking on the park's pier. They have a nice restaurant located right on the pier. Park time! The view of the beautiful midway. These canopies along the midway almost look like they could have been built for one of the World's Fairs. Did I mention that the midway is absolutely gorgeous? The park is home to one of only two Prior and Church Derby Racer rides remaining, with the other one being at Cedar Point. This thing is fast! It spins much faster than the unit at Cedar Point, however, the feature enabling the horses to race forwards and backwards throughout the ride has been disabled on this unit. These horses were carved by Illions. Next up was Superflight, a Zamperla Volare Flying Coaster. This was my first experience on one of these contraptions, and I do have to say that I enjoyed it. It is disorienting going through those curves, and the two slow speed heartline rolls are pretty intense and fun. I really enjoy the hangtime/airtime that you get with the freedom that these cage cars have. Next up is the historic Dragon Coaster. This coaster dates back to 1929 and is one of only three designs by Frederick Church that remain, with the other two being the Giant Dippers at Belmont Park and Santa Cruz Beach Boardwalk in California. This coaster has received the American Coaster Enthusiasts Coaster Landmark Distinction given to coasters that are of exceptional historical significance. Here are the two front cars for the original trains. The coaster now runs a set of Morgan trains that were installed in the 1980s. I do not mind the Morgan trains, although I would not mind if they were replaced at some point with PTC trains. The Morgans give a decent ride though, with multiple points of decent airtime. My mother and I riding the Dragon Coaster. One of the highlights of the ride is getting eaten by the Dragon! The Whip! It is a tough call whether this Mangels Whip or Camden Park's runs the strongest. There was a crowd of little kids from a camp that were riding on the cycle before us and the cycle we were riding on in this shot. It was so funny watching all of the little kids riding. They were so little, and the ride was so strong, that they were sliding out on the seat each time the ride spun around the drive wheels. Each time there was a collective leap out of the cars by the kids saying "THAT WAS AMAZING! LET'S DO IT AGAIN!" The reaction by the little kids epitomizes what is so great about this park. This is a place to be a kid, or to be a kid again. In addition to the other classics in this park, three ride through dark rides, and one funhouse, are located at the park. On the left you can see the park's funhouse, the House of Mirrors. On the right you can see Zombiecastle, one of the park's ride through dark rides. The park's third large coaster is this Zamperla Wild Mouse. Of all of the Wild Mouse models that I have ridden, Zamperlas definitely track the smoothest. The park's flume ride, with the bandshell tower standing tall on the left. The park's 1915 Mangels/Carmel carousel celebrates its 100th anniversary this year. It opened in 1915 at the former Savin Rock Amusement Park in Connecticut, before it was moved to Rye in 1929. Both Mangels and Carmel hailed from Coney Island and intact machines from both of these carousel purveyors are very hard to come by. Rye's is a stunning machine. Gotta ride the Dragon Coaster again! One of the most stunning features of the Dragon Coaster is that designer Frederick Church built it over his Old Mill boat ride. The Ye Old Mill is one of only a handful remaining Old Mill boat rides. The dark ride experts at Sally Corporation had a go at modernizing this ride, creating a "Voyage to the Center of the Earth" theme, complete with evil trolls. I have to say that this is a pretty awesome attraction. The view down the midway looking towards the bandshell and tower. The park's junior wooden coaster, the Kiddie Coaster, complete with an NAD junior coaster train. This is a pretty cool design. The park and grounds have the feel of a real step back in time. Absent are the higher prices found at larger parks, and the worries of the outside world. This classic park truly feels like an escape. I am certain that this is why the park is often sought out in movies and tv shows set in New York City as an escape from the worries of daily life. The character of Tom Hanks gets more than he bargained for in "Big" and has to deal with the stresses of adult life in New York City. 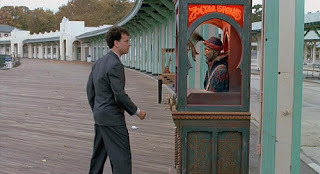 Rye Playland is also mentioned numerous times in Mad Men, where the people caught up in the drama and stresses of life are frequently looking for some escape out of their miserable lives. What better place for an escape than Rye Playland? A view of the George Washington Bridge back in Manhattan on the way out. Rye Playland should be a destination for all of you that love historic amusement parks.